A fair mount of excitement was generated earlier this fall when word got out that we were going to continue with a "La Nina" again this winter. 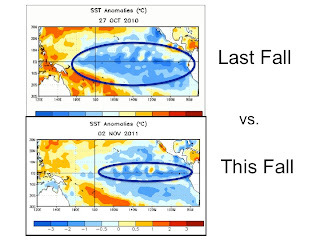 However, not all La Nina’s are created equal and this year’s La Nina is weaker than last years. Map comparing area of cold Sea Surface Temps (SST) around the Equatorial Pacific that defines a La Nina, below. La Nina/ El Nino Review: La Nina means colder than normal SST's in the Equatorial Pacific, and El Nino means warmer than normal SST's. 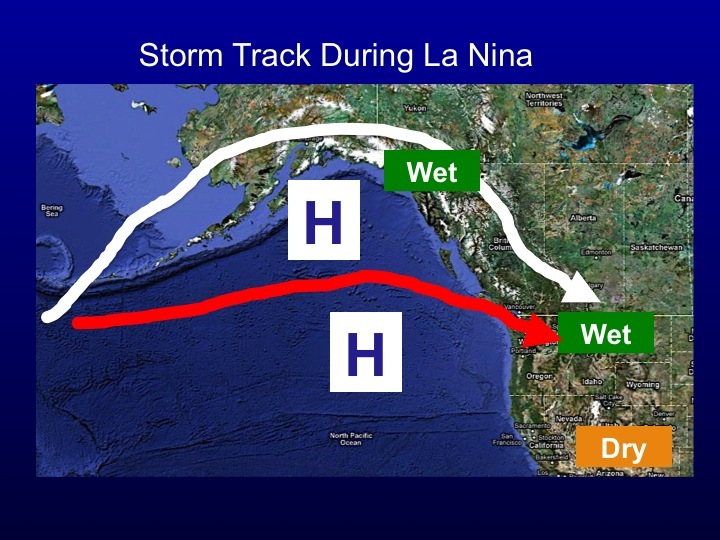 La Nina's usually keep the Northwest U.S. wet in winter and the Southwest U.S. dry. El Nino's usually have the opposite effect. By now you may have noticed a difference between the amount of snow and the frequency of snowstorms that we’ve had this season so far, compared to the way we started last season with a bang in late October. 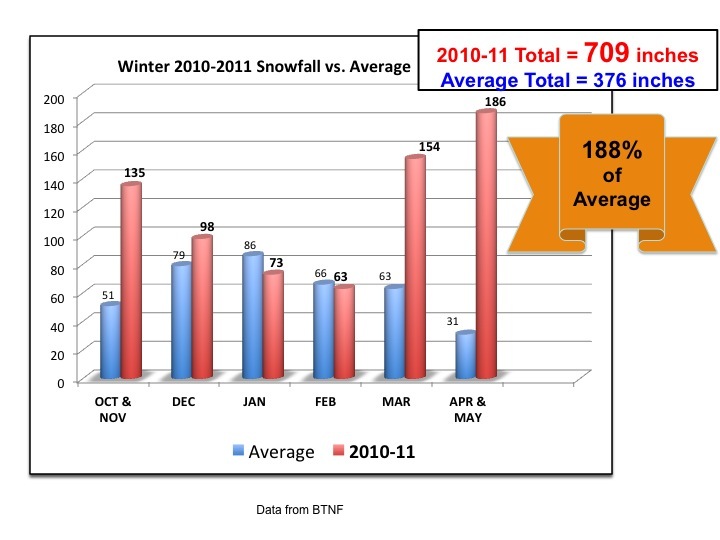 The Winter of 2011-12 is not off to the same start as last winter, and that is consistent across the entire Western U.S.
Pre-season snowfall, October & November 2011, was actually still a little above average in Jackson Hole, but nowhere near the amounts seen pre-season in 2010. (See graph below left). Here in Jackson Hole I suspect most folks naturally expected a repeat of the “700 inch” snowfall winter we had last year during that “La Nina”. Obviously the possibility of that wish coming true dwindles with each passing day without new snow. 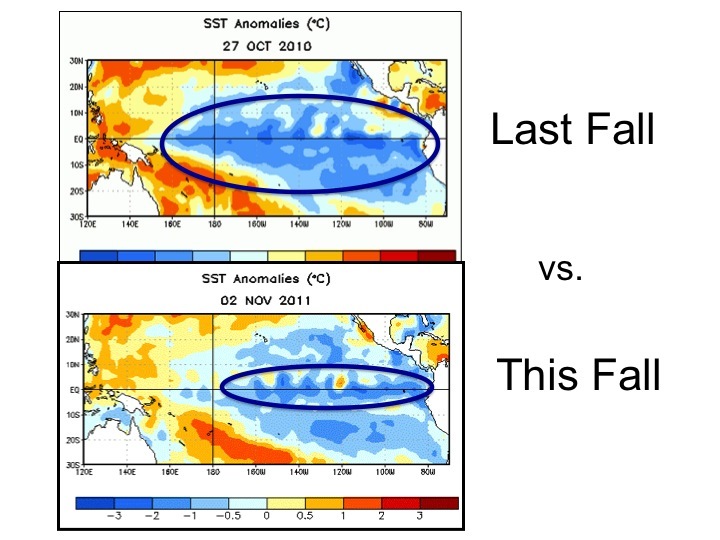 Again.....not all La Nina's are created equal! While a La Nina winter usually means that we will see above normal snowfall in the mountains (true for most Pacific Northwest and Northern Rockies mountain locations), it does not define how or when that snow will be delivered. Part of that is controlled by where a Ridge of High pressure sets up in the Pacific and where the main storm track sets up to bring Pacific moisture inland. Last year most of the winter the High was set up perfectly and storms rolled across Pacific Northwest, Sierras, Northern & Central Rockies almost continuously. (Red line on Map). This year the Ridge of High pressure, so far, as caused the storm track to take a more northern route up into Alaska. That has prevented the continuous train of Pacific moisture from coming directly across the Western U.S. (White line on Map). If you look at it statistically, in Jackson Hole the mountains have an above average snowfall 70% of the time during a La Nina year. Last Winter’s La Nina was strong to moderate, more like 2007-08. This year’s La Nina is weaker, more like 2000-01. Both of those winter’s saw above average snowfall at the end of the season tally, but when the snow came was decidedly different. 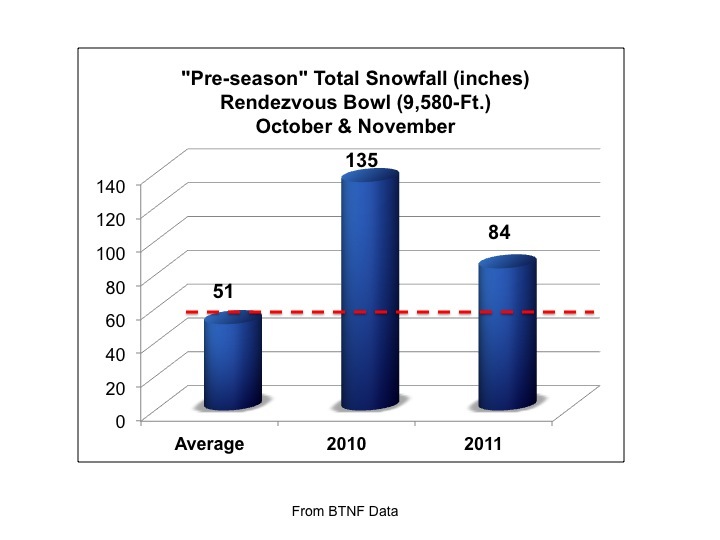 Even if you look closely at the snowfall distribution at Jackson Hole (9500-ft. Rendezvous Bowl Study Plot) from last winter (2010-11) most of the snow came pre-season and post-season. 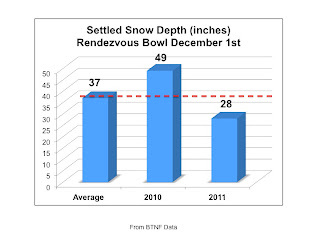 The mid-winter snowfall was just average, December thru February. While La Nina conditions are still expected to continue thru the northern hemisphere winter, although it may take a little longer for the weather pattern to finally change for the better (snowier). Right now it looks like there may be a more significant shift of that Ridge currently parked out in the Pacific, and subsequently see the storm track starighten out again across the Pacific by about the time we get to the Winter Solstice (Dec. 21). Below are the 3-Month Outlook Maps for January-March 2012, and the signature is still that of a La Nina, colder and wetter Pacific Northwest and Northern Rockies. Note that the line of above average precip do not extend as far south into the Sierras and Utah/Colorado like it did last year. ("EC" means Equal Chances of above or below average). Obviously we didn't see the pre-season snowfall that we had last year, and it’s unlikely we would ever duplicate the unbelievable post-season snowfall amounts that we saw last winter/spring. However, it would make sense to see a bigger mid-season snow than we had last year, and still make the Winter of 2011-12 come out above average. This Blog entry was adapted from a presentation given by meteorologist Jim Woodmencey at the Avalanche Awareness Night in Jackson, WY on December 1, 2011. 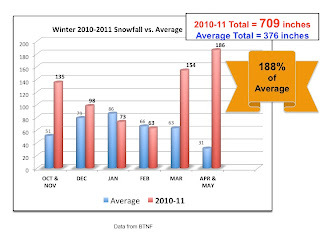 To underscore the unusual start to this La Nina, Flagstaff is at over 200% of average snowfall for this time of year. Maybe the ENSO forecast guys meant to say "El Nino"? Enjoy the bounty and ship some northward when you've had enough! That's a really good idea. The USA cabled weather stations are very useful especially for USA weather.